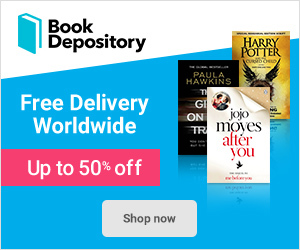 The Sin Eater’s Daughter – Book Review! This has been on my TBR list for quite some time. I have heard nothing but praise for this trilogy. I am so thankful I can now say I have finished the first book, The Sin Eater’s Daughter. Let me tell you, the hype behind this book is warranted. It is such a fantastic read! 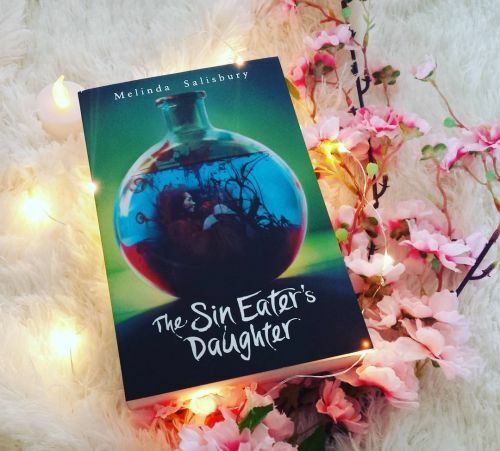 This is my review for The Sin Eater’s Daughter by Melinda Salisbury. Imagine living in a castle where people fear you. Well that is the life that Twylla lives. Once in line to take on the role as the Sin Eater, now she is the embodiment of a goddess. A single touch from her poisonous hands shall cause a person to die a painful death. Every month she attends The Telling, a ritual where part of her blood is mixed with Morningsbane for her to drink. To a normal person, this concoction would kill them instantly. But not Twylla, the Daunen Embodied goddess. Every time she drinks the potion and survives its deadly poison, it is a sign that the gods have truly sent their once daughter to live amongst the kingdom. But this was not the life Twylla had dreamed of. The queen who is a manipulative woman makes her use her powers to execute traitors to the throne. She is the giver of death. A weapon that people fear may be used upon them at the will of the queen. Ever since Twylla moved to the castle, she has been betrothed to the prince – Merek. This would show the kingdom that the gods deem their rule true and that as is well in the world. But not everything is as it seems. When one of Twylla’s loyal guards falls ill, she is left with 1 guard to watch over her, a man by the name of Lief. He is different from the others in the castle, for he is not from Lormere. He is from Tregellan, and so Twylla wonders why the queen has allowed him of all people to guard her. Lief talks to her like no other guard before, like he can see her for the girl she is and not a goddess. Before she knows it, Twylla starts falling for the new guard and things start spiralling out of control. She is betrothed to the prince, but she does not love him. Her heart belongs to Lief, and together they plan on committing the highest treason, running away together. But would Twylla really risk her life and his just to be happy? Would she really manage leaving the prince, who she knows wants her and only her to be his wife. Twylla needs to decide – Love or Duty? Oh my goodness where do I begin. To take matters literally, I bloody LOVED this book! From the very start I was entranced with the aspect of Twylla as an executioner. How a single touch from her could kill anyone. It was chilling and dark but gripping. The book really sucked me and I fell in love with everything. I am a sucker for beautiful worlds coming to life and this book did not disappoint. How Salisbury could bring to life the world that Twylla lived in was beautiful. How majestic everything in the city of Lormere was and how everything was destroyed in Tallith. The book felt alive and I wanted to know more about these places! Hopefully in the future I will! I also loved the aspect of religion in The Sin Eater’s Daughter. How everyone believed in these gods and praised the royal family as true rulers because of Twylla. She is the embodiment of a goddess after all. Time and time again she proves she is bless by surviving The Telling. Truly the realm is blessed because of her, right? Or do they just believe things because the queen says it is so. I’m not usually one to enjoy dark books or even books that include religion, but in The Sin Eater’s Daughter it played a big role in me wanting to read more. My heart reached out so much for Twylla as a character. 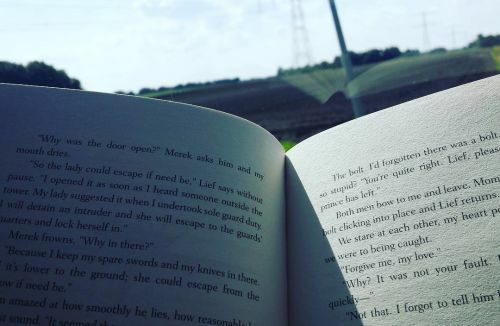 When it comes to books, I love a protagonist who is not perfect, and she certainly was not. Certain decisions that she made were either terrible or courageous. The fact that she decided against her mothers will to leave her family and go to the castle with the queen was a stupid mistake, one she later realizes. Her life in the castle is also not worth living, where she is constantly under guard and needs to be Daunen Embodied and the executioner. People look at her and fear for their lives. She hates how the queen uses her to kill people and she despises how heartless her rule is. So at least Twylla knows what is right and wrong. She knows what mistakes have been made and feels the need to suffer for it. Blaming no one but herself and this to me is a big factor of attaching myself to Twylla. But whats the most unsettling and dark aspect of The Sin Eater’s Daughter is that not everyone is truthful. Lies and deceit are riddled throughout the narrative and I swear to god it startled me just how cruel some people were. Not everyone tells Twylla the truth, but she too hides secrets, the main one being Lief. But when the time comes, she is quick to realize what has been hidden from her for years. When this happens, she becomes strong and willing to take risks and I love that! The queen was someone from the start I hated. I hated how she would use Twylla’s powers to kill people for crimes against the crown. She was a heartless character who only thought about herself and the kingdom under her rule. She would see that anyone who mocked her, the royal family and Twylla would be punished. The queen just wanted to kill people for the sake of it. Though the king and the prince were there and saw the things she done, they would never have the ability to stop her. Some her plans for the kingdom were quite literally sick, but Salisbury wrote her character in a way that made you love to hate her. She was the best worst person to hate. The perfect villain! I do look forward to hopefully reading more about Prince Merek in future books. He was a character who at first I was not sure about and thought he was just wanting Twylla because of what she was. I know that by the end of the book I didn’t feel so heated towards Merek, but I want to know more about his character. Lief means sweet or lovable in Dutch, fun fact! He was a lovely character, but my goodness my heart was thrown all over the room with his scenes. The whole love triangle aspect of Lief, Merek and Twylla… GAH. Overall The Sin Eater’s Daughter was a fantastic book. I was completely dragged in to the expansive world and I longed to know more. I really hope in future books I get to learn more about the places described. The characters were all beautifully written and fleshed out. Salisbury really made you feel emotions for Twylla while she lived under the thumb of the queen. The amount of emotions in general caused by the characters was insane. Love, Anger, Sadness – You name it, it’s probably there somewhere! At several points during the book I felt like I knew what was going to happen. Some times, I was correct and I felt happy about it. But for most of the book, I DID NOT SEE THINGS COMING. The narrative got dark, twisted and full on crazy and I couldn’t stop reading. The story came to life inside my head and once I closed the book, I could not stop thinking about it. I am super happy that I have no read this book. I heard so many things about it through Twitter and during a #UKYAchat night. The amount of praise this trilogy received made me want to check it out. The story and atmosphere alone makes The Sin Eater’s Daughter a must read. I 100% recommend anyone who enjoys darker fantasy with twists and turns to read this book. I cannot WAIT to start the second book of the trilogy next – The Sleeping Prince. 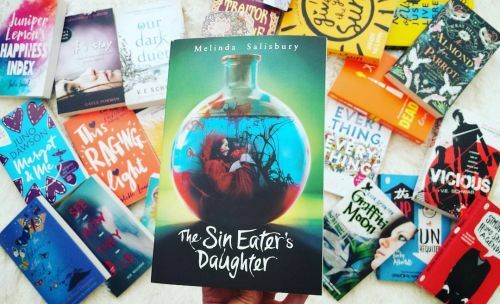 The Sin Eater’s Daughter by Melinda Salisbury, a dark fantasy that keeps you on your toes and fills you with every emotion known to man, gets a stunning 5 out of 5 flails. Previous Previous post: Scotland Plans!